Turkish Ministry of Health defines “off-label” drug use as the use of licensed pharmaceutical products at doses outside the approved indication and the use of unlicensed medicinal products that are imported for the purpose of individual treatment. The aim of this study was to evaluate the use of off-label or unlicensed drugs in urological cancers in order to understand the perspective of Turkey within this area of healthcare provisions. This study involved metastatic bladder cancer patients (n=105) receiving paclitaxel or other off-label drugs, metastatic renal cell cancer patients (n=194) receiving sorafenib, sunitinib or other off-label drugs, and metastatic testicular cancer patients (n=44) receiving paclitaxel, gemcitabine or other off-label drugs in Turkey. A computer search was performed using patient-based database of Turkish Medicines and Medical Devices Agency (TITCK). According to data from TITCK database, the number of applications for off-label drug use was 86 for metastatic bladder cancer, 136 for metastatic renal cell cancer and 44 for metastatic testicular cancer. The approval rates for off-label drugs were 90.47% for metastatic bladder cancer, 62.88% for metastatic renal cell cancer and 88.63% for metastatic testicular cancer. 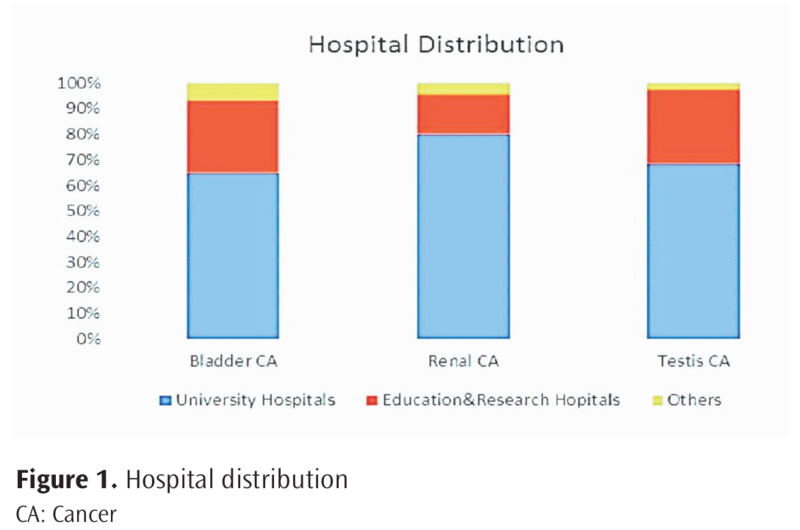 University hospitals made the majority of applications for metastatic bladder cancer (79.89%), metastatic renal cell cancer (64.76%) and metastatic testicular cancer (79.89%). The most preferred off-label drugs for bladder, renal and testicular cancers were paclitaxel (84.04%), sorafenib (68.42%) and paclitaxel (43.24%), respectively. Off-label drug use in urological cancers is increasing in Turkey. If the use of off-label drugs increases in parallel to the use of off-label urology drugs, it is necessary to define new ways of evaluating applications. A large number of licensed medications are routinely used for unapproved indications or dosages, routes of administration, or age groups. This kind of use that is not described in the package insert is called “off-label use”. This term includes unlicensed, unregistered or ‘‘compassionate use’’ (1). Off-label use is prescribing pharmaceuticals for an unapproved indication or in an age group outside of an approved indication for use, dosage, or route of administration (2). In Turkey, physicians may prescribe off-label or unlicensed drugs under the control of Turkish Medicines and Medical Devices Agency (TITCK) (http://www.titck.gov.tr). TITCK evaluates off-label and unlicensed drug use for each patient through off-label application procedures. A physician who wants to prescribe an off-label or unlicensed pharmaceutical has to apply to TITCK for patient-based approval. TITCK evaluates each application based on published scientific evidence and academic consultants. If TITCK approves off-label or unlicensed prescriptions, the cost of the drugs subject to these prescriptions will be reimbursed by Turkish Social Security Institution (SGK) (http://www.sgk.gov.tr). The aim of this study was to evaluate the use of off-label or unlicensed drugs in urological cancers to understand Turkey’s perspective within this area of healthcare provisions. In addition, we hope that the results of this study will help to update the guidelines and determine pharmaceuticals and off-label indications in urological cancers, such as metastatic bladder cancer, renal cell cancer and testis cancer. This study involved metastatic bladder cancer patients (n=105) receiving paclitaxel or other off-label drugs, metastatic renal cell cancer patients (n=194) receiving sorafenib, sunitinib or other off-label drugs, and metastatic testicular cancer patients (n=44) receiving paclitaxel, gemcitabine or other off-label drugs in Turkey between May 2008-May 2011. Informed consent was obtained from these patients in accordance with the legislation on the use of off-label drugs. These are available in the records of Ministry of Health. The TITCK database was used to examine off-label drug use in the treatment of urological cancers. In the analysis, the off-label use of drugs during the urological cancer therapy were evaluated to provide an understanding of Turkey’s perspective within this area of healthcare provisions. Outcomes were evaluated based on the application status, approval period, locational applications, hospital category and drug status. In addition, it was aimed to help update the guidelines and determine pharmaceuticals and off-label indications for no-need to approval process of off-label indications in urological cancer pharmaceuticals. Discriminant analysis was conducted with Microsoft Office Excel 2011 program. The data obtained from TITCK database between May 2008-May. 2011 showed that 86 applications were submitted for off-label metastatic bladder cancer drug use, 136 applications were submitted for off-label metastatic renal cell cancer drug use and 44 applications were submitted for off-label metastatic testicular cancer drug use. The mean age was 64.62±19.42 years for metastatic bladder cancer, 60.52±19.22 years for metastatic renal cell cancer and 39.77±34.66 years for testicular cancer (Figure 1). 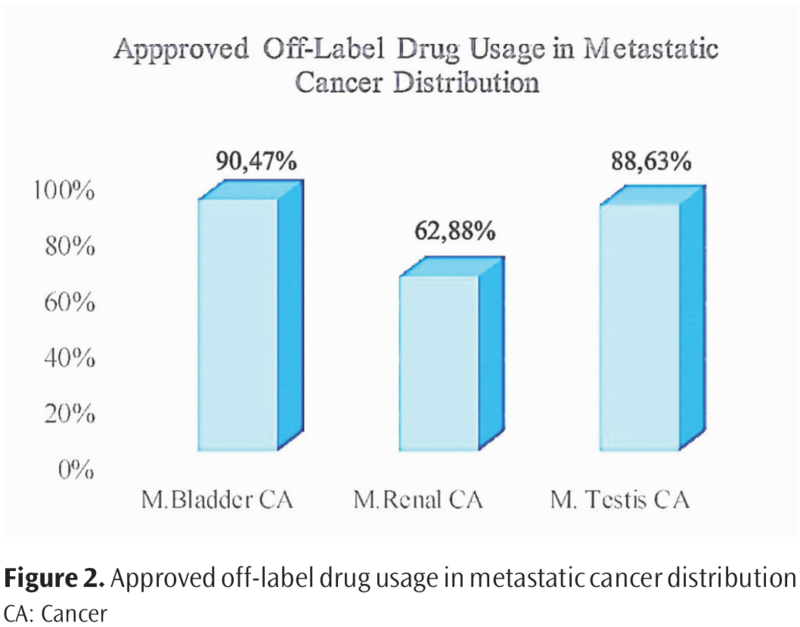 Ninety-five (90.47%) off-label drug applications were approved for metastatic bladder cancer, 122 (62.88%) for metastatic renal cell cancer and 39 (88.63%) for metastatic testicular cancer (Figure 2). Also, these applications were concluded in a 12-week period for all cancers. However, the procedure may be longer if the application requirements are acceptable. Most of the applications for metastatic bladder cancer (79.89%) were made by university hospitals, followed by training and research hospitals (28.57%) and private hospitals (6.66 %). 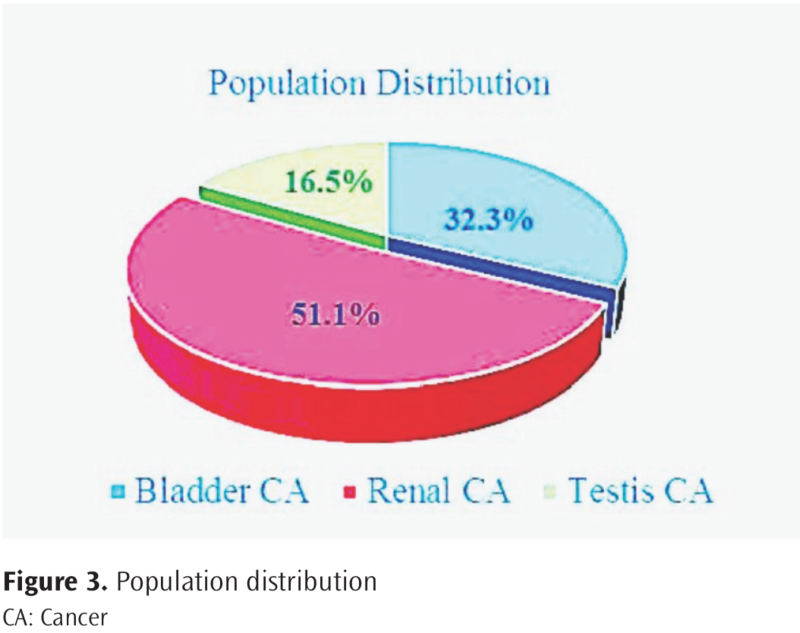 This distribution was similar for renal and testicular cancers (Figure 3). 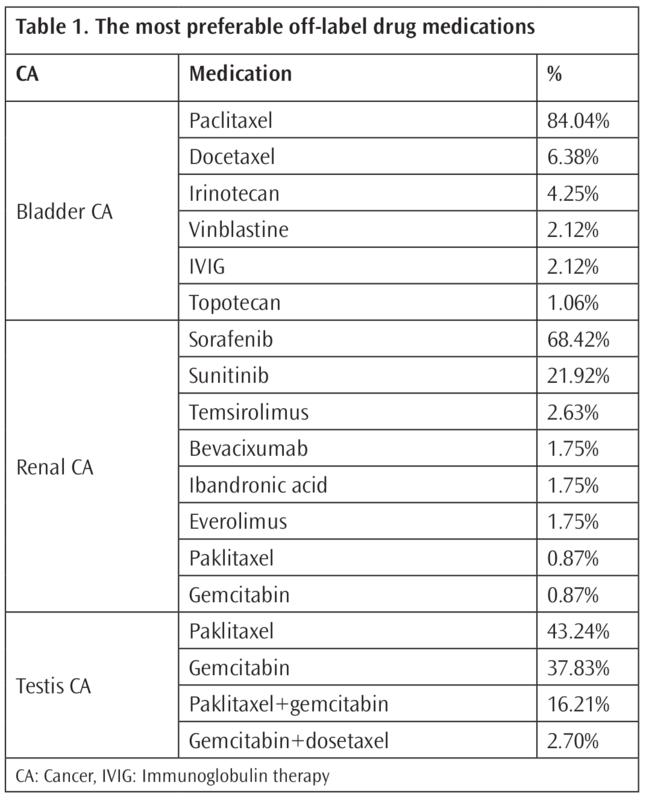 The most preferred off-label drugs for bladder, renal and testicular cancers were paclitaxel (84.04%), sorafenib (68.42%) and paclitaxel (43.24%), respectively (Table 1). The principles underlying the use of unlicensed drugs are the same as those of off-label drugs. In general, off-label use is not recommended, but there are legal procedures in many countries’ laws and regulations after applying all normal treatment protocols (1). There may be cases when a physician has used all of the normal treatment options, and off-label and/or unlicensed medicinal products may be the last option (3). Off-label drug use is preferred in many countries (4, 5). One of the studies reported that 55% of prescriptions were licensed, 19% were unlicensed, and 26% were licensed pharmaceuticals used through off-label policies. In fact, unlicensed preparations were used in pediatric patients (6). Off-label drug use is also public policy in Turkey in such that off-label use may lead to reimbursement restrictions. Off-label drug use is defined by the Turkish Ministry of Health as the use of licensed pharmaceutical products at doses outside of or exceeding the scope of the approved indication and the use of unlicensed medicinal products that are imported for the purpose of individual treatment. Therefore, off-label use covers both licensed and unlicensed products (7). When an unlicensed drug is approved by TITCK, the Turkish Pharmacists’ Association is then responsible for importing (3). TITCK also publishes guidelines for using pharmaceuticals without patient-by-patient based approval process. If a pharmaceutical is mentioned in these guidelines for use in an off-label indication not yet approved, physicians can prescribe it. The pharmaceutical will then be reimbursed by SGK in the off-label indication without approval process. This indication is mentioned as “no-need to approval process of off-label indications” in the guideline. No-need to approve process helps to increase the efficiency of off-label use and decrease the workload of TITCK. The use of off-label drugs in Oncology has been estimated to reach 50%, or even more (2, 3, 8). In pediatrics, the off-label issue is more common, especially in pediatric oncology (3, 8). In general, the use of these drugs, although off-label, are fully “evidence-based” and therefore falls within the scope. Nonetheless, the off-label use of drugs may be considered illegal. In practice, off-label uses are often “tolerated” under restrictions, in spite of the size of the phenomenon, especially in some medical fields (3, 9). Unlicensed or off-label drug use is controlled by the Ministry of Health in Turkey. Oncology drugs are imported for such uses. It was reported that unlicensed or off-label medicine use has been rising over the past few years in Turkey (3). On the other hand, off-label drug use is a rising issue in medicine. A PubMed search for “off-label drug use” demonstrates that the majority of the articles were published in recent years (10-14). While the number of published articles was 35 in 2000, it was 368 in 2014 (14). Off-label urology drug use is increasing in Turkey as the off-label use of other oncologic drugs (3). Debates about the use of expensive cancer drugs should consider post-marketing assessments. The longer duration of off-label drug use in clinical practice and the high rates of off-label drug use are encouraging for new clinical trials. If off-label drug use increases in parallel with the use of off-label urology drugs, new ways of assessing applications should be defined. Informed Consent: Informed consent was obtained from these patients in accordance with the legislation on the use of off-label drugs. Surgical and Medical Practices: S.K., Concept: M.H.T., Design: M.H.T., Data Collection or Processing: P.T., G.K., İ.M.V., Analysis or Interpretation: M.E.B., Literature Search: M.H.T., G.K., Writing: M.H.T., P.T., M.E.B. Mesgarpoura B, Müller M., Herknerbb H. Search strategies identified reports on ‘‘off-label’’ drug use in MEDLINE. Journal of Clinical Epidemiology 2012;65:827-834. Stafford RS. Regulating Off-Label Pharmaceutical Use-Rethinking the Role of the FDA. N Engl J Med 2008;358:1427-9. Kockaya G, Polat M, Vural İM, Akbulat A, Dedeoglu BD. Off-label and unlicensed oncology medicine use in Turkey: a retrospective analysis of computer records of the Turkish Ministry of Health. J Pharm Health Serv Res 2011;2-1:53-7. De Mario MD, Ratain MJ. Oral chemotherapy rationale and future directions. J Clin Oncol 1998; 16: 2557-67. Batlle JF, Arranz EE, de Castro Carpeno J, Saez EC, Aunon PZ. Oral chemotherapy potential benefits and limitations. Clin Transl Oncol 2004;6:335-40. Conroy S, Newman C, Gudka S. Non-licensed and off-label pharmaceutical use in acute lymphoblastic leukaemia and other malignancies in children. Ann Oncol 2003;14:42-7. Roberts R, Rodriguez W, Murphy D, Crescenzi T. Pediatric drug labeling: improving the safety and efficacy of pediatric therapies. JAMA 2003;290:905-11. Casali PG. Executive Committee of ESMO, The off-label use of drugs in oncology: a position paper by the European Society for Medical Oncology (ESMO). Ann Oncol 2007;18:1923-5. Radley DC, Finkelstein SN, Stafford RS.Off-label prescribing among office-based physicians. Arch Intern Med 2006;166:1021-6. Borner M, Scheithauer W, Twelves C, Maroun J, Wilke H. Answering patients needs: oral alternatives to intravenous therapy. Oncologist 2000;6:12-6. Sharma S, Saltz IB. Oral chemotherapeutic agents for colorectal cancer Oncologist 2000;5:99-107. O’Neill VJ, Twelves CJ. Oral cancer treatment:developments in chemotherapy and beyond Br J Cancer 2000;87:933-7. Soares M. Off-Label’ indications for oncology pharmaceutical use and pharmaceutical compendia: history and current status. J Oncol Pract 2000;1:10-105.